I am still making, always making, although I am often questioning WHY? It has been a real gift to hear Brené Brown give credence to one's creative needs. In fact, her research showed that we must create in order for us to live wholehearted lives. 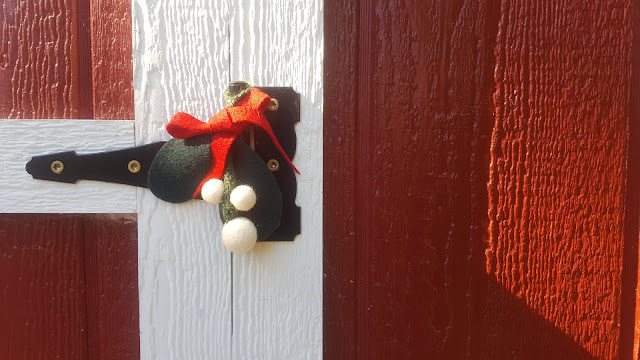 I first made this woolly mistletoe out of a desire to relive the traditions of my childhood. Every year as we unpacked our Christmas things, I delighted in the possibility of mistletoe-kissing. I loved catching my parents under the mistletoe, and would often plant myself in that prime location in hopes of getting some extra smooches. I haven't felt (get it? felt?) like making them so much with so many other choices out there. But I do have some, and they are available if you are so inclined, at my Etsy shop here. Or, you may get a hand-crafted, fair trade version from Nepal here. I really don't mind what you choose - I didn't invent mistletoe or wool. I actually source the wool berries on my version from Nepal as well, but I construct the rest from yarn and upcycled wool. I do feel good about working with wool and utilizing upcycled sources for fabric. I appreciate that I am using something biodegradable and natural that can still be enjoyed for many years. I will be sharing more handmade goodness here and there. Thank you for taking the time to read and visit.